Finally all shirts arrived from the printer. 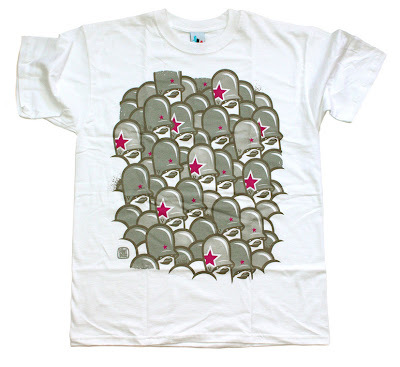 You can get them as usual over at RockawayBear.com. There you can find more t-shirt colours and also the FF-Blitze-Logo black-on-black to fit the Teddy Troops Series 03 packaging style. And we have a new Dave The Chimp shirt, too. 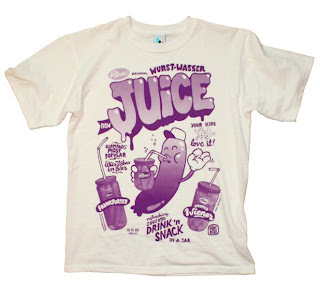 Burn your old stuff and get some good new shirts to sport this summer! 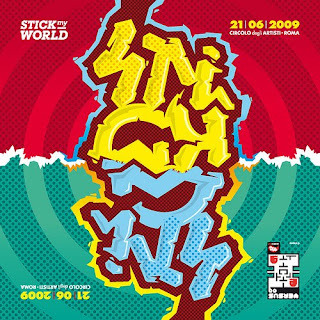 While being "off" to Munich i missed to post the Stick My World event in Rome i took part in. 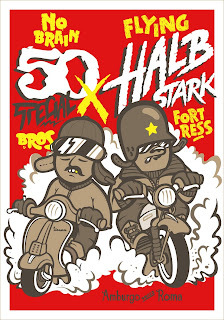 Together with ThaRootboy from NoBrain crew we came up with this colaboration poster design. Hopefully we will have a small run of signed prints available soon. Amburgo verso Roma. "Halbstark - Oh Baby - Baby - Halbstark!" 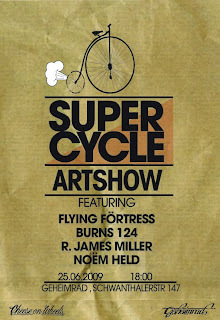 Upcoming Thursday 25th of June there will be the "SUPER CYCLE Artshow" at the Geheimrad bike store in Munich. Together with my friend Burns124, R. James Miller & Noem Held. 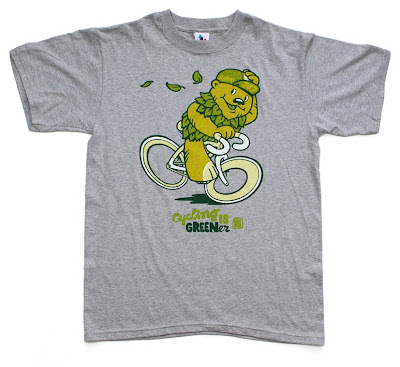 There will also be my new "Cycling Is Greener" t-shirt be available (will post pictures later today). Auf geht's Buarsch'n! Für alle Starrnarben & Einzelgänger! I have been to Munich this weekend for my friends' wedding. The day before i had a quick rendezvous with Christ/WY in the rain while having a hang-over. Thanx for taking care of everything! 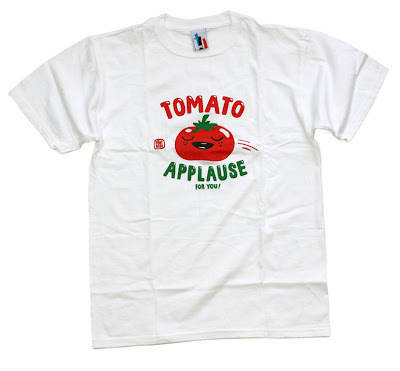 The new shirts are just starting to pop in from the printer. 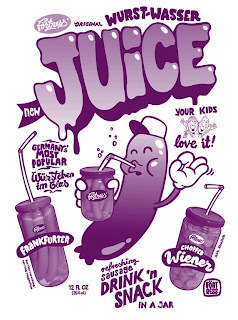 The "Wurstwasser" design is one of my favourites. The whole idea is based on a story a friend told me a while ago. 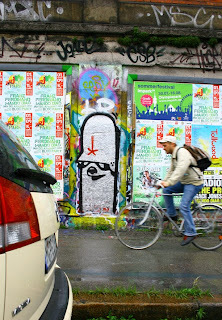 He was hanging out at a plaza in Munich when seeing a junkie-twosome with a baby in a buggy. The parents where totally stoned and having a guzzle attack. So they were eating cheap sausages out of a jar. La class! After finishing they just poured the left-over water from the jar into the baby's bottle. Yummy! Your kids love it! I have been to Weil am Rhein to set up my booth inside the Carhartt Gallery for the "Public Provocation" group exhibition. 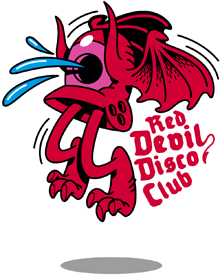 Please visit it to see all the inside artwork there. Really a great collection of artists set up there. We also had time to paint the outside on a sunny day before i had to leave home. More flix soon. 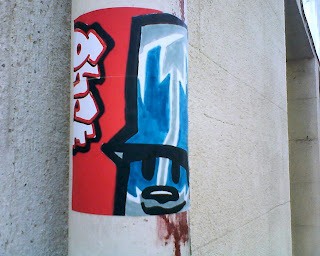 My good friend Cptn.Rouget sent me in this lovely tribute sticker he spottet in Avignon/France. Merci! 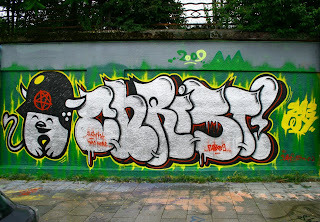 To be honest when i started to do graffiti i was also a little copy-cat. I just re-draw style letters from Loomit and Neon that i had seen at the local hall-of-fame. I guess this is still the best way to get into some basic knowledge at the beginning of your passion.